Thinking about using one of those ubiquitous motorized scooters to zip around town in Santa Monica, Westwood or another area? Before you hop aboard, you should take precautions and learn the rules of the road to prevent potentially serious injuries, says the lead emergency physician at UCLA Health’s Santa Monica campus. Dr. Wally Ghurabi, medical director of the Nethercutt Emergency Center at UCLA Medical Center, Santa Monica, has seen firsthand the harmful and painful effects from these devices, including head injuries, broken bones, lacerations and abrasions. 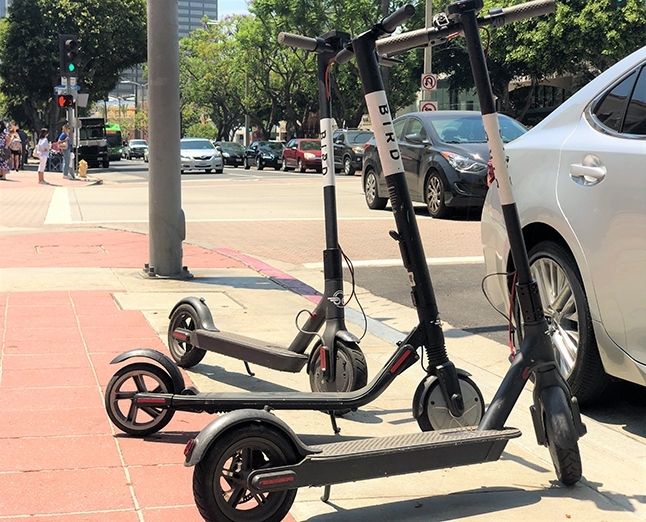 Legislation sponsored by Bird, the Santa Monica-based company behind the scooter-sharing service, that would eliminate the helmet requirement for adult riders is not a good idea, Ghurabi says. The scooters can travel at speeds up to 15 miles per hour, Ghurabi says, and helmet-less riders have no head protection if they are struck by a vehicle or hit a bump and get tossed from the scooter. Learn how to control the scooter before you start zipping around. Never ride two to a scooter. You’re increasing the risk of someone getting hurt. Don't ride on sidewalks, which may be illegal anyway in your city. Be responsible. Don't leave scooters in the middle of sidewalks or walkways where they can be a hazard. Ghurabi likens the current “scooter mania” to the rollerblading craze of the ‘80s, which brought an influx of patients into his and other emergency rooms.